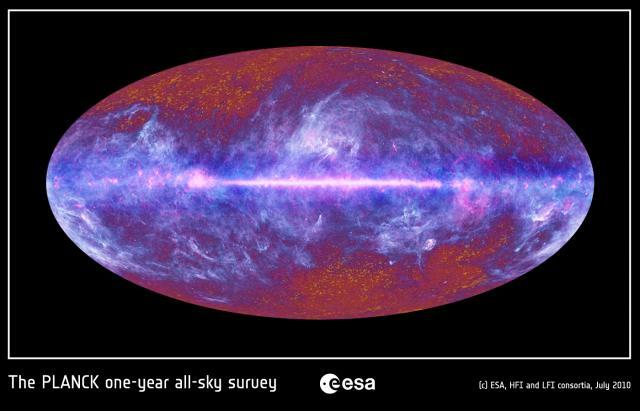 Hot from the press today is a release of all-sky images from the European Space Agency’s Planck mission, including about a year’s worth of data. You can find a full set of high-resolution images here at the ESA website, along with a lot of explanatory text, and also here and here. Here’s a low-resolution image showing the galactic dust (blue) and radio (pink) emission concentrated in the plane of the Milky Way but extending above and below it. Only well away from the Galactic plane do you start to see an inkling of the pattern of fluctuations in the Cosmic Microwave Background that the survey is primarily intended to study. These images are of course primarily for PR purposes, but there’s nothing wrong with that. Apart from being beautiful in its own right, they demonstrate that Planck is actually working and that results it will eventually produce should be well worth waiting for! Oh, nearly forgot to mention that the excellent Jonathan Amos has written a nice piece about this on the BBC Website too.